This is an acquired autoimmune disease originally called Hughes syndrome where there are antibodies to phospholipids or phospholipid-protein complexes and clinical evidence of associated thrombosis, thrombocytopenia, and recurrent fetal loss. 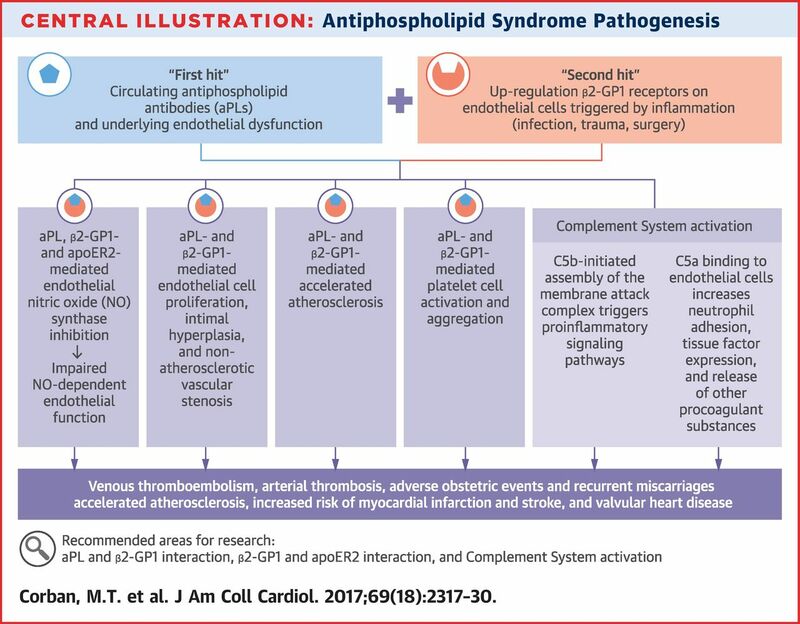 Despuet over 35 years from the original description of antiphospholipid syndrome (APS), our understanding of this disorder is still evolving. Screening for APS is often part of a young stroke work up. It is important as it is one of the thrombophilia disorders associated with potential arterial thrombosis as most of the other inherited thrombophilia disorders are associated with venous thrombosis. It is very important to notice that a transient aPL positivity is often seen with acute infections and thus documentation of the presence of persistent (at least 12 weeks apart) antibodies is crucial for diagnostic purposes. Antiphospholipid antibodies are not specific to APS but can be detected in different clinical settings, including in healthy individuals. The may be seen with other autoimmune conditions (including systemic lupus erythematosus (SLE). Studies have estimated that the prevalence of antiphospholipid antibodies in the general population ranges between 1% and 5%, but the antibody titre in most of these studies was low. An increased prevalence of antiphospholipid antibodies has been reported with ageing, with the highest values reported in healthy centenarians but without an association with clinical manifestations of APS . Incidental APS Antiphospholipid antibodies but no thrombotic or related obstetric complications (i.e., do not fit criteria for APS). Some may consider low dose aspirin. APS Antiphospholipid antibodies with arterial or venous thrombosis Usually Aspirin +/- Warfarin. Obstetric APS antiphospholipid antibodies and a history of pregnancy-related morbidity such as the loss of 3 or more embryos before the 10th week of gestation and/or 1 or more otherwise unexplained fetal deaths beyond the 10th week of gestation, and/or the premature birth of a morphologically normal neonate before the 34th week of gestation because of eclampsia, severe pre-eclampsia, or placental insufficiency but no history of thrombosis and so thrombotic risks hard to assess and determine. Fetal monitoring. Women with recurrent pregnancy loss can receive aspirin +/- prophylactic-dose LMWH and warfarin post partum. Transoesophageal echocardiogram is strongly recommended in APS patients with ischaemic stroke as there is a high yield of valvular abnormalities. Some people have APS antibodies but no signs or symptoms of the disorder. Having APS antibodies doesn't mean that you have APS. To be diagnosed with APS, you must have APS antibodies and clinical evidence of the APS. Take a general approach in stroke patients. Look at general vascular risks factors such as obesity, smoking, diabetes, immobilisation, BP, lipids, and if on oestrogen. There can arise a situation in which antibodies are positive in a patient who may have another aetiology. It is for that reason that it is not advised to check in those over the age of 50 unless there is clear clinical indicators e..g. they have SLE. A risk benefit assessment is needed. Anticoagulation: This often requires anticoagulation (warfarin is avoided in pregnancy). The RCP does not recommend testing those over the age of 50. This seems reasonable if there are no other specific red flags. The difficulty is that even with positive APLs there may be an alternative cause of stroke. If for instance that is also an indication to anticoagulant then it is straightforward. If it isn't then it is more difficult and a choice between anti-platelets (Aspirin, Clopidogrel) and anticoagulation (Warfarin, LMWH, DOACs) needs made. For those with definite APS and stroke then initial plan would be warfarin with a a target INR of 2.5. This might be higher for recurrent episodes or those with catastrophic disease. One other concern is that APS is often associated with thrombocytopenia thereby increasing risks of haemorrhage if severe. Miyakis S, Lockshin MD, Atsumi T, Branch DW, et al. International consensus statement on an update of the classification criteria for definite antiphospholipid syndrome (APS). J Thromb Haemost. 2006;4(2):295–306. Meroni, P. L. et al. Anti-beta 2 glycoprotein I antibodies in centenarians. Exp. Gerontol. 39, 1459–1465 (2004). Sciascia, S., Bertolaccini, M. L., Roccatello, D. & Khamashta, M. A. Independent validation of the antiphospholipid score for the diagnosis of antiphospholipid syndrome. Ann. Rheum. Dis. 72, 142–143 (2013).